SPOILER ALERT: I will discuss elements of the film’s plot. If you’d like to watch it with a blank slate, I recommend watching the film before reading this review. Then, after you watch it, come back for the discussion! Superhero movies are supposed to be fun, right? The genre has long prided itself on fantastic visuals, wittiness and the drive for something greater than ourselves. At the same time, I’ve long felt that superhero films themselves can aspire for more. When you have such great stories and characters, can’t they do more than just hype us up for the next film? Thankfully, the 2018 slate of superhero films brought us some fresh takes on the genre. Black Panther was a cultural phenomenon that had exquisite craft from the writing to the costume design. But even after that step forward, I thought the year’s other massive superhero film - Avengers: Infinity War - took the genre back into its universe-building habits. Instead of constantly building the universe we’ve come to expect, can’t there be superhero film that would expand the universe and our ideas of what these films can do? This film absolutely explodes off the screen with visuals that will wow you every step of the way. Instead of appropriating comic book stories into a CGI-laden visual style, this film embodies the comic book style for an experience that is both retro and completely new at the same time. The film’s use of Ben-Day dots for background shading and new illustration techniques are so groundbreaking, in fact, that Sony has sought a patent for the film’s visual techniques. The visual style makes this film fun and awe-inspiring at the same time. But incredible visuals alone cannot carry a film. 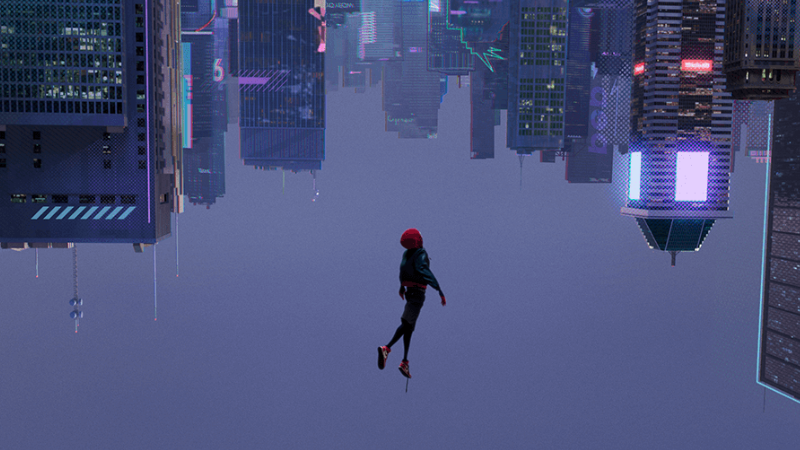 You must have a compelling story, and Spider-Man: Into the Spider-Verse has a great one. The film begins by playing into an issue that has dogged most Spider-Man films (until 2017’s Spider-Man: Homecoming, that is) - they focus on basically the same story. Our old friend, Peter Parker (voice of Chris Pine), re-introduces himself by giving us the quick version of the bit-by-a-spider/Uncle Ben/hero-to-the-rescue story that we all know. He then reminds us of a key theme in most superhero films - he’s the only one. He’s the sole Spider-Man who saves the people from bad-guys. There’s no one else like him. Cut to Miles Morales (voice of Shameik Moore). He’s a high school kid who has recently moved to a new prep school. His father Jefferson (voice of Brian Tyree Henry) and mother Rio (voice of Luna Lauren Velez), want him to hone his talents in a healthy environment. But Miles isn’t quite sure that he fits into this new environment. He’s an artist, something his Uncle Aaron (voiced by Mahershala Ali) understands. Aaron is Jefferson’s brother, but the two have become estranged due to Aaron’s criminal past and the fact that Jefferson is now a police officer. But it is Aaron who encourages Miles to hone his artistic abilities. The two go to a secluded area of the subway system where Miles shows off his latest graffiti creation. It is there that a certain spider finds its way onto Miles’s hand. The radioactive spider bites Miles, and you may feel like we’re headed down the same Spider-Man path. But this film has a lot more in store. Yes, there are large stakes and outsized villains just like in other superhero films. What this film does that many others don’t do is that its screenplay gives slight nods and winks to those very elements. This is a smart screenplay by Phil Lord and Rodney Rothman. It is funny at times and emotional at others. It brings the wit and fun we want from a superhero film while also having depth that you might not expect. At all times, this is a film about inspiration. Everyone has greatness inside of them, they just have to take a leap of faith. The basic plot is that the big baddy - Kingpin (voice of Liev Schreiber) - has joined forces with Doc Ock (vocie of Kathryn Hahn) to create a Super Collider that will unlock other dimensions and parallel universes. Miles happens upon this when he goes back to the subway tunnel where the spider bit him after he starts to notice that his hands are super sticky. A large blast occurs, and Miles finds himself watching a fight between the “real” Spider-Man and the Green Goblin (voice of Jorma Taccone). The Collider explodes, and Spider-Man is badly injured. Before the villains catch him, Spider-Man gives Miles a drive that can shut down the Collider. If it is restarted, infinite universes will be unlocked and life as they know it will be forever changed. Miles takes the drive and begins to leave, but he looks back to see Kingpin kill Spider-Man. Now it is up to Miles to save the universe. It’s not fair at all to knock a superhero film for having a plot that is too outsized and unbelievable. If you’re watching a superhero film for its adherence to reality, you’re watching the wrong genre. Superhero films are the epic stories of our generation. Epics - whether they be Greek mythology or space operas - always take us outside the confines of what is “realistic.” But I think the best examples from these genres are the ones that use fantastic stories to inform our reality, not just to get us to escape it. This film does that wonderfully but putting our main character in a story where he does not believe in himself at first. He compares himself to others and feels he comes up short. He doesn’t know if he’s up to the task. But, as the story continues, he realizes that you don’t have to have it all together to join the fight. It might take a leap of faith or two, but if you feel that spark of greatness within, you must not hide it due to insecurity or fear. You must step out and give what you have. What you have might just be a lot more than even you can imagine. The “parallel universe” plot device is such a perfect choice here for many reasons. First, it gives fantastic opportunity for visual creativity. I could just spend the whole review praising the film’s visual style. It really is incredible in a fresh way. At the same time, while it is certainly a fantastical story, there’s enough science in the trippy world of quantum physics that at least gives the writers a jumping off point that begins in our world even if it takes us far out of it along the way. It also allows for many other characters to appear in the film now that the Collider has opened up other parallel universes where there are also other Spider-people. We even get a different incarnation of Peter Parker (now voiced by Jake Johnson). This film also does the hard work of getting us to understand the motivations of its villain. Why would Kingpin want to open up a portal that would destroy the universe in which he lives? It’d be easy to simply make it a financial gain for him, and that aspect is certainly present. But, through flashback, we learn that his family died in an accident of his own making. He wants to open a parallel universe so that he can bring them back. By the end of this film, I was moved, inspired, entertained and invigorated. To say this is the freshest superhero film in some time would be an understatement. I think it is the best superhero film of the year and high on the list for the best ever made. The craft on display here is absolutely wonderful. This is why we go to the movies. Note on content: This film should be appropriate for most viewers of all ages. It carries a PG rating, and most of its mature content comes in the type of violent action you would expect in a superhero film. There are fights and large-scale collisions that may be difficult for the youngest of viewers. But I think this film offers ample opportunity for great discussions between parents and children, and there is no sexual or other adult content that should preclude most viewers from enjoying the experience.